Divorced fathers protest court, police bias, slam women's organizations for touting equality but working against it. 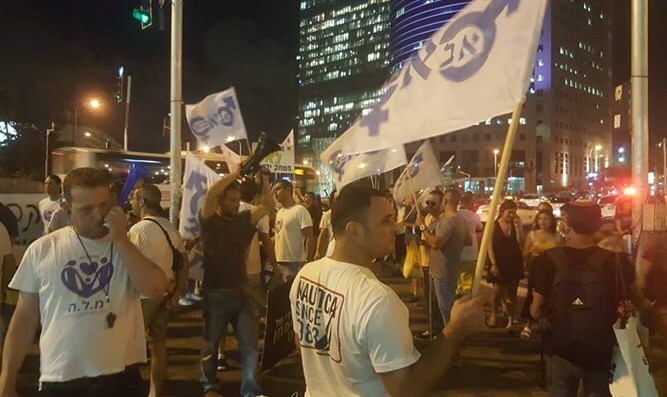 Dozens of divorced fathers demonstrated on Sunday night near the Azrieli Towers in Tel Aviv, blocking the Kaplan Junction. The fathers demanded equal parenting, protesting the fact that family and rabbinical courts preferentially grant custody to mothers, without regard for the quality of parenting or the children's relationship with their parents. They also protested the policy regarding child support, which almost never requires mothers to pay and charges fathers outrageous and untenable amounts. In addition, police and state prosecutors allow women to submit false accusations against men, with no consequences even for repeat offenders. The women's organizations, they said, like to talk about equality but for years have torpedoed any attempt to make changes in the divorce laws so that they will be more equal. Over a decade ago, two expert committees in Israel's Justice Ministry suggested that Israeli courts adopt an egalitarian custody policy. However, their suggestions were never implemented. MK Oren Hazan (Likud) attended the protest, speaking with the demonstrators.